(C) 2010 BeLight Software, Ltd. All rights reserved. BeLight Software, Ltd. reserves the right to improve, enhance and revise its products without notice. The information in this document is furnished for informational use only, is subject to change without notice, and should not be constructed as a commitment by BeLight Software, Ltd. BeLight Software assumes no liability for any errors or inaccuracies that may appear in this document. All trademarks, product and/or brand names mentioned in this publication, are the sole property of their respective owners. Written by Nick Shubin. Cover design by Viktoriya Naumova and Tatiana Onishchenko. Thanks to Ray East for help with the creation of this publication. 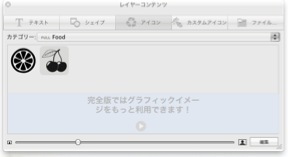 To install, double-click the Art Text installer in Finder. Then drag the Art Text icon into the Applications folder. “~/Library/Application Support/BeLight Software/”. Here “~“ is user’s home folder. From time to time, the software developer releases new versions of the product. To change your copy to a new version, you just need to install an update. Before launching the update installer, make sure that the application and the supporting files are at the default location. Usually they are if you have followed the installation procedure and didn’t change paths or transfer files manually. The default file location can be found in the “Installing and Removing Art Text” section. If you have already purchased Art Text from BeLight Software or its resellers, you will find the license code either on the back of the disc envelope (boxed retail edition) or in the purchase confirmation e-mail (retail or standard edition via download). menu. 3. Enter your name and license code. It’s recommended that you keep the e-mail or the disc package containing your license code in a safe place in case you need to register the application after re-installation or update. The unregistered version of Art Text is fully operational. The only limitation is that it adds the “Trial” text over the resulting image. To eliminate this text, you need to register your copy of the software. 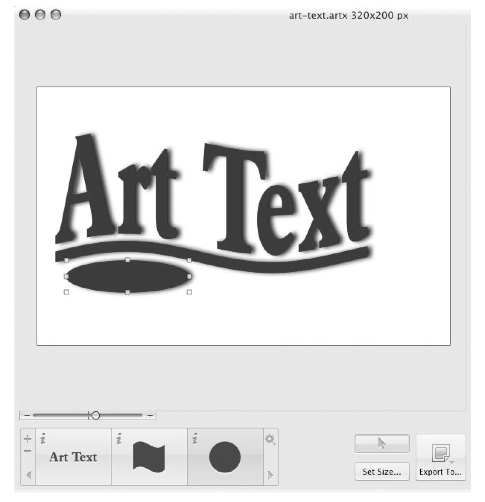 The developer of Art Text offers free technical support. When reporting a problem, please make sure to specify: • The version of Art Text you are using. • The version of Mac OS X installed on your computer. • Your previous actions that could have lead to the problem. • If the problem persists, describe how to reproduce it. • When necessary, illustrate your report with screenshots (press Cmd-Shift-3 to save a screenshot on your Desktop). Information about Art Text, links to the Download, Latest Update, Buy, and FAQ sections. Check it out for updates, new product announcements, and special offers. Visit this link if you have questions about the software. • Art Text built-in Help. Choose Help > Art Text Help in the program menu. The information below covers the most important settings to start your work with Art Text. 1. Register the program if you have purchased a license code. Otherwise, the program will work in the demo mode. To do this, choose Art Text > License... from the menu to open the registration dialog box. Input your name and your license code. After successful registration, the program will offer you online registration. You can register or skip registration. 1 – Deselect the Open Template Gallery on start-up check box if you don’t use the built-in templates. 2 – Keep the Snap option enabled. Text and images will align to each other when you move them around. 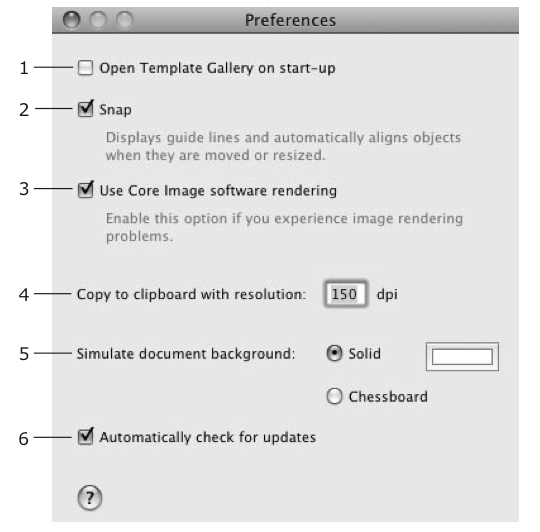 3 – Keep the Use Core Image software rendering option disabled. In this case, rendering is quicker because the graphic card (not the CPU) does this job. 4 – The resolution of an image pasted in the clipboard. It is important when your work is finished and you are going to copy it to another program. Leave this parameter alone for now. 5 – Color of the document background. It is simulated on the canvas. The chessboard background lets you see transparent parts of your design. The Solid color is used for the background of the exported image if the selected graphic format doesn’t support transparency. 6 – Specify whether the program should check for updates automatically. A style is a set of effects that can be applied at once. Styles are located in the Styles tab of the right side panel. Choose View > Styles Panel to open it. Styles are grouped into categories. You can choose a category in a pop-up menu at the top. You can add custom styles to the library. To apply a style, select it in the side panel. The selected style will be applied to the active layer. Parameters of applied effects can be saved as a custom style. This is useful when you need to create several pieces of text or several images with the same effects. To add a new style, click the “+” button. To remove a custom style, select it in the list and click the “-” button. Built-in styles cannot be removed. The Use content from style option lets you choose whether to show the selected style with the default content or with your own. Note that the default content was selected as the best for demonstrating the style. To access templates, choose File > Template Gallery (Cmd-Shift-N). Templates are grouped into categories. To open a different category, click on its name at the bottom of the window. To open a template, double-click on its thumbnail. Or click on a thumbnail followed by the Choose button. You can use templates to learn the program or modify them to create a new document. Note that templates and styles are not the same. A template is a complete document. A style is a set of settings that can be applied to your text or image. Templates can consist of one or several layers. This guide describes some possible steps of using Art Text. Steps described below and their order are not obligatory. Some of them can be skipped, performed several times, or in another order. For a better understanding of the location and names of program controls, it is recommended that you look through “The Art Text Workspace” section. Set up the final image size (what will be exported to a file or another program). To do this, click the Set Size button in the main window. The white or chessboard-like background shows the image edges. Objects or their parts outside the image area will be trimmed at export. You can change the image size at any time later. By default the “Art Text” text is displayed on the canvas. To change text or replace it with an image, double-click the “Art Text” icon in the bottom panel (Layer bar). 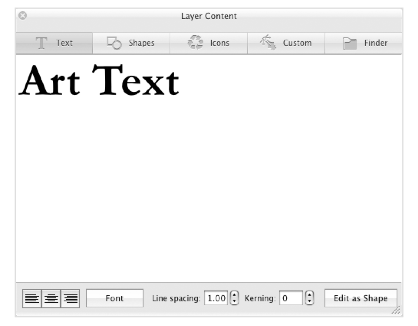 This will bring up the Layer Content window displaying the Text tab. To choose a shape or icon, switch to the corresponding tab. 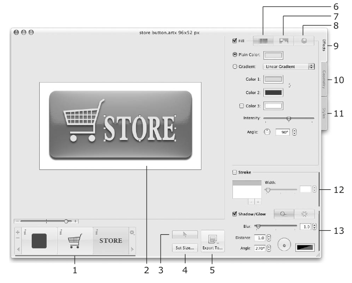 Once you have changed the layer content (text or image), close the panel. The icon in the Layer bar will change correspondingly. The color and fill related settings can be found in the Effects tab (4) of the right panel. You can choose color or gradient fill (1), texture library (2), or materials (3). You can also apply stroke (7), shadow (8), or glow (9) effects. The Geometry tab (5) is described below. Browse through the library of pre-designed styles (6). A style is a set of effects that can be applied at once. Styles are located in a separate tab. You can preview them applied to your text or icon. To do this, deselect the Use Text from Templates check box at the bottom. To change the shape of text or icon, open the Geometry tab in the right panel. It displays thumbnails of geometric transformations. Choose one by clicking on it and adjust the amount of distortion using the slider(s) below. Handles on the corners and sides of the object frame can be moved with the mouse. Drag them to resize or change the shape (spline transformations only). Each new text or image should be located in a new layer. Icons of layers are shown in the Layer bar at the bottom of the main window. To add a new layer, click the “+” button in the Layer bar. Unnecessary layers can be removed using the “–” button. A new layer will contain the default text. Step 3 describes how to change it. Steps 4 and 5 describe how to apply effects to the content of new layers. Note that depending on your design idea, this step can be performed after adding new layers, but before applying or adjusting any effects. 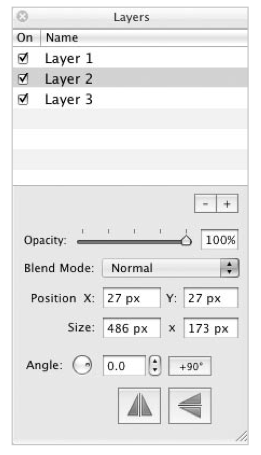 Two controls in Art Text are responsible for layers: Layer bar and Layers panel. The Layer bar is located at the bottom of the main window. The Layer bar displays icons of layers with layer content. When a layer is active, the icon is highlighted. When you apply effects or change their settings, the active layer is affected. To add a new layer, click the “+” button. To remove the active layer, click the “-” button. Layers overlap each other. The icon of the top layer is to the right in the Layer bar. The bottom layer is to the left. Drag an icon left of right in the bar to change the layer order. The Layers panel displays names of all the layers in the document. 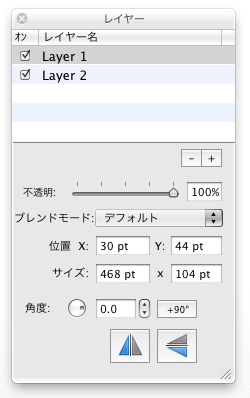 You can drag them in the list to change the layer order. The panel lets you rotate layers and change their opacity and blend mode. 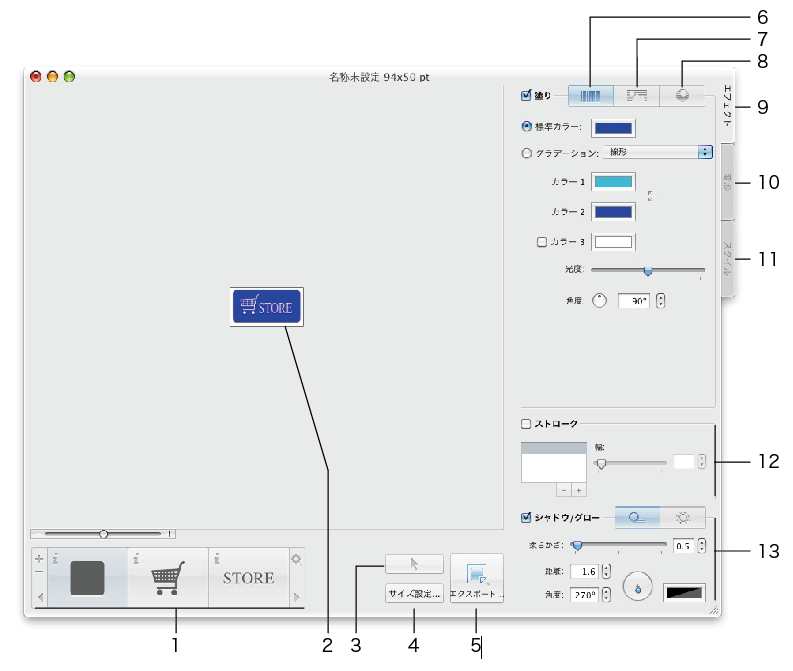 To open the panel, choose Window > Show Layers Panel from the menu. 1. Add a new layer. 2. Move its icon in the Layer bar to the leftmost position. 3. Double click the icon to open the Layer Content panel. 4. 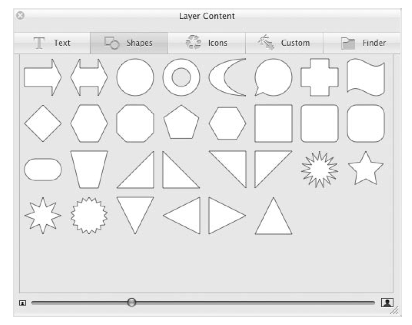 Open the Shapes tab of the panel. 5. Click on a rectangle and close the panel. 6. 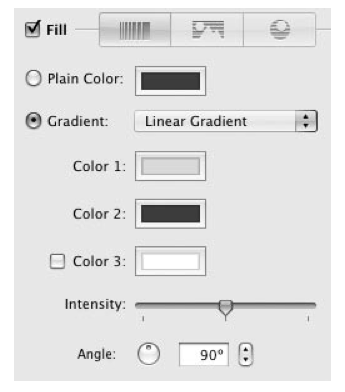 To choose a plain color or gradient, open the Fill tab in the Effects section. 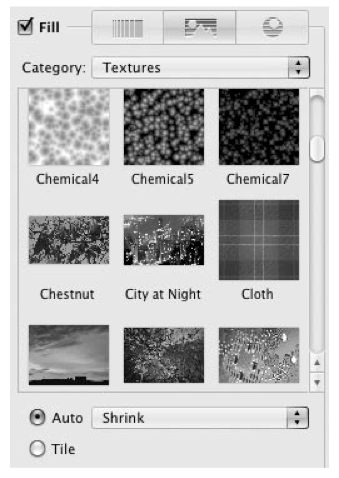 To choose an image, open the Texture tab in the Effects section. Click the Category drop-down list and choose a library section. Then click on an image. To select an image located on the hard drive, choose the Finder item in the Category drop-down. Select a folder containing images. To export your work, click the Export To... button in the main window. Then choose the destination: the clipboard or a graphic file. The resolution of the image pasted into the clipboard can be set in the program Preferences (Cmd-,). When you are exporting to a file, choose the graphic format, resolution, and type a file name. Some formats have more export options.